Proverbs 31 describes the Capable Wife as one who looks for the wool and the flax to use in weaving. In the reconstructed house at Qatzrin (in Israel’s Golan Heights), wool and flax are waiting to be spun, and then made into clothing. 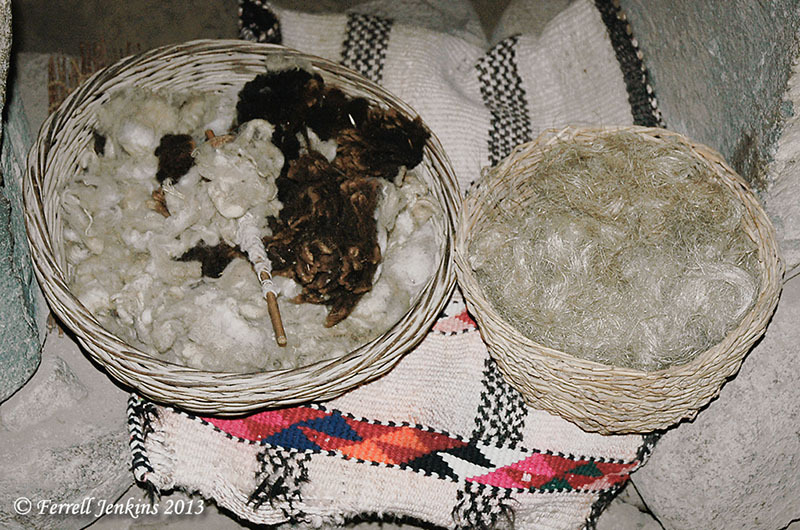 Wool & flax were used in the making of clothes in Bible times. Photo by Ferrell Jenkins. The two other texts where wool and flax are mentioned together are in the prophet Hosea. Israel, in her unfaithfulness to the LORD, is described as getting here wool and flax, along with other household goods, from her lovers (Hosea 2:5). The LORD makes it clear that he is the source of her supplies. Jesus wore a tunic (Greek, chiton) that was woven in one piece (John 19:23). The chiton was a garment worn next to the skin by both men and women. The distaff and the spindle. Weaving exhibit at the Hecht Museum. This entry was posted in Bible Study, Culture, Israel, New Testament, Old Testament. Bookmark the permalink.